How do I use my wheeled walker safely? There are four main activities that you need to perform safely when using your walker. The following are general guidelines and are not appropriate for everybody. You are strongly encouraged to seek guidance from a therapist for your unique situation. Place both hands on the arms/seat of your chair OR one hand on the chair and one hand on the walker. 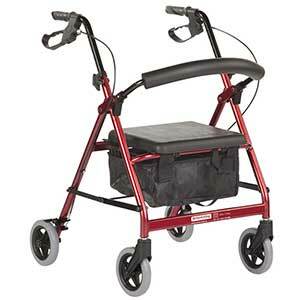 Do not tip the walker by placing too much weight on one side of the walker as you stand. Use your legs to stand as much as possible – your arms should only lift what your legs cannot. Use your arms mostly to help keep your balance as you stand. Stand directly in front of the chair, facing away from it. The back of your legs should be almost touching the chair. Do not start to sit until you are balanced and standing still. Reach behind for the chair with both hands (preferred) or with one hand and one hand on the walker. If your steps are uneven, its best to shorten your longer step rather than work to lengthen your shorter step.